Campaigners have launched a crowdfunding bid to hold Burma's leaders accountable under international law for the Rohingya Muslim crisis. Nearly half a million of the country's Rohingya minority have fled to Bangladesh after Rohingya insurgent attacks against police posts led to a massive retaliation by the Burmese military. The United Nations has accused the army of "textbook ethnic cleansing" to push the Rohingya out of Burma, and rights groups allege the army has committed crimes against humanity. Hussein Mohamed and Najma Maxamed have launched a crowdfunding campaign to get leading human rights lawyers to begin building the legal case to hold Burma's leaders to account at the International Criminal Court. They started the campaign after becoming frustrated with the lack of action concerning the Rohingya Muslim crisis, and have already gathered over 400,000 signatures for a petition in support of their campaign, which will be delivered to Downing Street on Saturday. If successful, lawyers will begin investigations in Bangladesh by talking to Rohingya refugees and gathering their first-hand accounts. They will then establish which people have allegedly perpetrated acts of violence while gathering evidence from existing UN reports. The campaign has several legal objectives, including the production of written complains to show Burma is in violation of multiple international treaties. It also aims to seek support in setting up an International Commission of Inquiry, which the UN High Commissioner of Human Rights has already called for. "The tragedy unfolding in Myanmar clearly requires a legal response," Saimo Chahal, joint head of public law and international teams at Bindmans LLP, told The Independent, using an alternative name for Burma. "While there has been widespread political condemnation across the world, a concerted legal effort to bring the perpetrators to justice must be mounted now. Time is of the essence when gathering evidence of this kind and exploring the appropriate avenues for a challenge in international court." She added: "This crowdfund will allow people to come together, take action and contribute to making that critical early work possible." Mr Mohamed, who helped launch the campaign, added: “We started this campaign because nothing is being done to hold the leaders of Myanmar to account. The world is horrified but that horror is not enough. This campaign is for people who want to have a real impact and begin the process of getting justice for those women, children and families that have been killed, traumatised and displaced." Several international aid groups have urged the Burmese government to allow free access to Rakhine State, where much of the violence is taking place. The government has stopped international NGOs, as well as UN agencies, from working in the north of the state, citing insecurity. The violence and refugee exodus is the biggest challenge the government of Nobel peace laureate Aung San Suu Kyi has faced since it came to power last year in a transition from nearly 50 years of military rule. 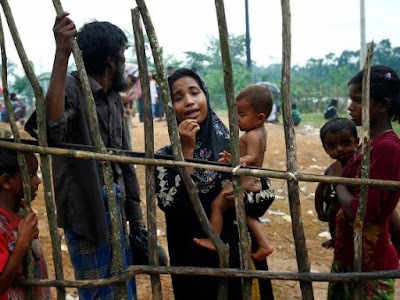 Burma considers the Rohingya illegal immigrants from Bangladesh, although they have lived in the country for generations. Most Rohingya are stateless and have faced bouts of suppression for decades. Ms Suu Kyi has faced scathing criticism and calls for her Nobel prize to be withdrawn. Last week, she denounced rights violates and vowed abusers would be prosecuted. She also said any refugees verified as coming from Burma under a 1992 process agreed with Bangladesh would be allowed to return.